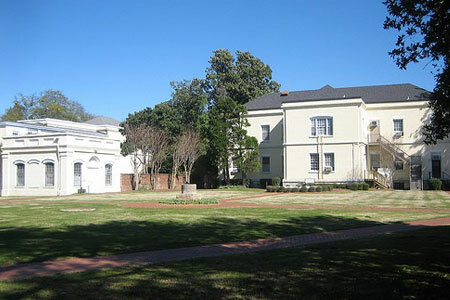 The Augusta Arsenal was originally constructed circa 1815 near the Savannah River just above the city of Augusta. This proved to be an unhealthy location. Not long after the arsenal was occupied in 1819, nearly all the members of the garrison died in a fever epidemic. Due to this event, the government decided to relocate the facility to a healthier environment. In November 1826, a tract of approximately 70 acres was purchased for this purpose. The Walker tract, or "Bellevue tract", was located on the western outskirts of Augusta in the early nineteenth century. During 1827 and 1828 the Arsenal buildings were dismantled and reconstructed on the low, sandy Walker tract. All of these structures survive as administrative facilities for Georgia Regents University.